The immediate past governor of Akwa ibom State, Chief Godswill Obot Akpabio has described the petition of alleged corruption against him to the Economic and Financial Crimes Commission as false and baseless. Speaking through Mr Aniekan Umanah who served him as Information and Communications Commissioner, Akpabio, who is currently in the Senate representing Akwa Ibom North East said he was responding to the petition by one Barr. Leo Ekpenyong with great sadness. Senator Akpabio however stated that rather than condemning Ekpenyong for taking this course of action, he is grateful to God that the petition is an opportunity to clear a lot of misconceptions and horrendous lies, those opposed to his(Akpabio’)s emergence and leadership of the state had fed the rumour mill in Akwa Ibom State. Senator Akpabio observed that the petition betrays a lack of understanding of the workings of government, noting that, every sum withdrawn from a government account is tied to a subhead and a budgetary provision, explaining that, attributing fraud to withdrawals, which had the full sanction of Government, and was accommodated in the budget is mischievous. On amounts bandied by the petitioner as the gross earnings of Akwa Ibom under Akpabio, the former governor disputed the claims arguing that, the idea that the Akwa Ibom State Government received over N2.5 trillion (or N3 trillion) in the eight years of his administration is an outrageous lie. Such claim, he said would mean the state received an average of N26 billion monthly, which he faulted, harping that, Published accounts of disbursement from the Federation Accounts, corroborate the evidence that Akwa Ibom State never received up to N26 billion in any month throughout his tenure, adding that, in some months like April and May, 2015, Akwa Ibom State received about N8 billion only. On the allegation of owning various houses in Abuja, Lagos and other countries, Senator Akpabio described the allegation as false maintaining that, ownership of the said houses can be verified from Lagos State Land Registry as well as from the land registry in Abuja respectively. Senator Akpabio also cleared the air on owning any property in Ghana or in St. Kitts & Nevis, and challenged anybody to prove the contrary. Explaining that, he was invited to attend the inauguration of the current President of Ghana as a member of the Presidential delegation from Nigeria alongside many other Governors and Nigerians who were on the delegation, Akpabio disclosed that, he was also invited to attend the 30th Independence Day celebration of St. Kitts and Nevis by the then Prime Minister who visited the State on a working trip to Nigeria, and wondered how simply visiting a country could translate into owning properties there. 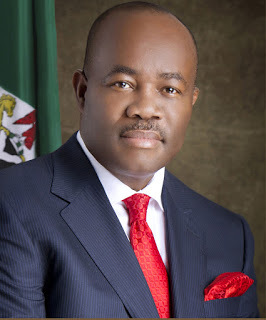 While dismissing allegations of picking the leadership of ALGON and owning shares in Julius Berger, Senator Godswill Akpabio said contracts awarded followed due process and charged his traducers to acknowledge his track record of performance, visible and landmark achievements in office rather than finding faults where there is none, regretting that, the opposition have, in their desperation and frustration, crossed the line of decorum, truth and decency with their torrents of propaganda and blackmail. Thanks for reading " Petition against me is baseless - Senator Akpabio ". Put your thought below.